The Poultry Handling and Transportation (PHT) Certificate developed by Pennsylvania State University in collaboration with the USDA and now managed by USPOULTRY was awarded to Tyson Foods. This follows training of approximately 1,000 company poultry and transportation workers completing PHT certification. The company is now certified for all complexes. The system audited by third-party specialists includes biosecurity, emergency planning, safety and humane handling of birds from harvesting through to delivery to the plant. 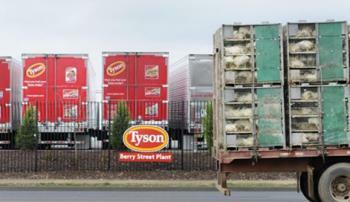 Tyson welfare activities are initiated and monitored by a panel of professional exports. See recent posting on progress by Perdue Farms in transport and CAS by entering ‘Perdue Farms’ in the SEARCH block.